It seems as if I am writing about the same subject just about every week, but the “what quarterbacks go where” story in the first round has more plot lines than a good novel. 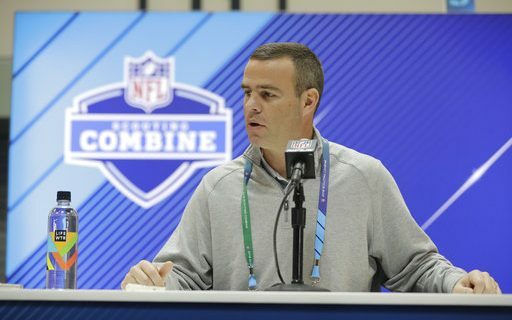 Saturday morning the New York Jets in a move that looked a little like a desperation move, trading the sixth overall pick in the first round to the Indianapolis Colts for the third overall pick. The Colts also received two second round picks this year (numbers 37 & 49) as well as their second round pick next year. Why Did The Jets Do This? Why did the Jets make this move? They went hard after free agent quarterback Kirk Cousins and lost out to the Minnesota Vikings. To make sure they got one of the top quarterbacks in this Draft they had to get to the third pick. As I have written previously, the Cleveland Browns with the first pick will take a quarterback, if in fact after they Jets trade they are just about forced to. No one knows what the Giants will do at number two, so in the Jets view they will at worst get the third quarterback drafted if the Giants select a quarterback. In making this move the, the Jets paid a high premium. Using the trade chart as a guide the move from six to three generally costs 600 points. The Jets paid over 1000! The number 37 pick is worth 530 points and the number 49 pick is 410 points. They also gave up their second round pick next year and because the pick is a year out, it is discounted one round for point value. With that in mind and not knowing where that second round pick actually is, clubs will use a mid third round pick as a guide. A mid third is worth about 100 points. So for a 600 point move the Jets gave up 1040 points. What that trade did, was it set the market for future moves into the top five in the 2018 NFL Draft. Last week the Bills traded tackle Cordy Glenn for a swap of first round picks. The Bills gave Cincinnati their 21st overall pick for the Bengals 12th overall selection in the first round. That put the Bills in position to move into the top five is they so desired. The Colts were willing to move back but not as far back as the number 12 pick. They felt that going back to six or seven, they would still be able to select one of the top three non-quarterbacks in this Draft. If they had made a trade with the Bills even though they could have picked up more picks, they also would have lost out on the value of one of the top players. Getting a premium player was the first thought the Colts had when making a trade. Now that the Jets/Colts trade is complete, what do the Bills do as far as getting into position to draft a quarterback? They could still try and move up and the number two or number four pick may be available. The Giants with two may be willing to move if they are not going to take a quarterback. The Browns have the fourth pick and they may also want to move especially because they got their quarterback at one. One thing is certain though, the price to get to number two or four will be much higher than it was a week ago. Do the Bills want to pay that premium? The other part of the equation that comes into play is regardless of what the Bills may want to pay, neither the Giants nor Browns may want to move. The Colts didn’t want to go back as far as 12 because of the drop off in the talent level of the players they can get at 12. The Browns and Giants may feel the exact same way. I wrote last week, that the evaluation of the quarterbacks is not complete and won’t be until after the clubs go through private workouts with each of the players they have interest in. It will be another three weeks or more before that exercise is complete. With the March owners meeting next week in Orlando, there won’t be any private workouts through at least Wednesday of next week, so the earliest the Bills can get started is next Thursday, unless they do one or two at the end of this week. On Monday in Peter King’s MMQB, Bills General Manager seemed to verify that. He said that spending 15 minutes at the Combine with the quarterbacks was not enough time to get a good feeling for each of the players. A private workout can last anywhere from four to six hours and it’s after those are complete that Beane and Head Coach Sean McDermott will have a better feel for each quarterback. After the Bills finish all their private workouts they may feel that some of the quarterbacks in the so called “second tier” of quarterbacks may be better “fits” for the Bills. History of the draft has shown that to be true. Selecting from the group of Mason Rudolph, Lamar Jackson or Kyle Lauletta may be better for the Bills than Sam Darnold, Josh Allen, Josh Rosen or Baker Mayfield. As I have stated many times, the top group of quarterbacks in this draft is vastly overrated and may not be worth selecting in the top five. The problem is with quarterbacks, clubs more often than not pay a premium to draft them because every club has to have one. The bottom line is this story is far from being over. There is still five weeks to go before the draft and I’m sure there will be many more moves made. In the end, the Buffalo Bills decision makers will do what they feel is best for the club going forward.